How would I describe Quantico? I would say it's somewhat of a mashup between How to get away with murder (a.k.a HTGAWM) and The Blacklist season 3. 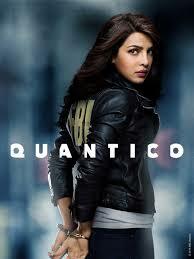 Though it's darker than HTGAWM and more awesome than The Blacklist, but if you enjoyed even one of those shows... definitely check Quantico out. And if you don't know any of those shows, then: Do you love mystery, intrigue, twists at every turn, action and even romance is thrown into the mix? If the answer is yes, definitely check Quantico out. The whole time, the show jumps back and forth between the past and present. In the past, Alex is an extremely promising trainee at the FBI academy. In the present, Alex is framed for a bombing she did not commit. She is on the run as she's trying to clear her name, find out who the real terrorist is and get her old team from Quantico back on her side. Mysteries are revealed, secrets are unraveled. And the biggest question of all: Who is the real threat? It's hard to organize my thoughts. I only finished Quantico a few days ago but I'm still reeling. This show was full of revaluations and twists. And that ending... it hit me. Hard. I'll go right to it, then. The Ending. And work my way from there. Oh, that's clever! Making us think it was Drew, then making us think it was Miranda and basically making us suspect every recruit when all along... it was Liam. I can't say I was: "OMG! I CAN'T BELIEVE IT!" over this, or that it was the greatest plot twist ever but I certainly was surprised. All this time, we were led to believe it was a trainee, someone from Alex's class... which is why we never even considered the possibility it might be Liam. "The voice", "The terrorist", is no other than Liam. I had no idea the guy was a freaking psychopath. The length he went through for his plan! He killed hundred of innocent people. He killed Natalie. He killed the hacker who helped Alex and the bomb maker who helped Simon. He even pretended he was drunk and slept with Alex for the final touches of his plan. And then he framed it all on Alex. With no remorse whatsoever. He was following their every move. And they had no idea. That's how he always stayed 7 steps ahead of them - he knew them. Their secrets, their dreams, their weaknesses. He knew everything. He planned everything. Every single step was methodical and exact. Yeah, he's defiantly a psychopath. Oh my god, NO. Simon, oh Simon. No. Just... no. This is too much. Too sad. Simon became one of my most favourite characters on the show (second only to Alex). From nerdy and slightly awkward to creepy and a bit scary, he became a loyal friend who, at the end of the day, always had Alex's back. Even when her own friends were against her, Alex could always count on Simon. And before I knew it, I started to count on him too. And now... I can't believe he's gone. I just can't believe it. I had a feeling, a horrible feeling, that something like this might happen. That Simon was going to die. But I didn't want to believe it. Out of everyone... no, no, no, no, no. That scene, when they with him on the phone, and they were all just breaking down... I was breaking down with them. I replayed that scene five times because I just could not accept it. "I didn't spend more time with you." And before I start crying and demand Simon's return to the show, I'll list some random stuff to calm myself. I really like Alex. She's a clever, resourceful and brave woman. And she doesn't give up. No matter what. She would go through fire to reveal the truth and get justice for everyone, even if it burns her. The whole world is literally against her yet she doesn't crumble - she fights back with everything she's got. All that mistrust - Grrr! I mean, what the hell?! Why is everything Alex does\says\believes in is somehow wrong and considered insane? (Especially after everything she's been through). Why can't they just believe in her for once? Yes, I'm talking to you, Ryan. You call yourself in love with her but when push comes to shove it's: "Alex is obviously insane and needs to be put into a mental hospital." And not: "I love her. Even if what she says sounds crazy, I need to help her figure this out. Because she's important to me." Hasn't she proven right so many times in the past? And when she finally does do what you want her to do - it's somehow still not good enough? Sorry, but you're her friends, right? This show keeps you guessing at every turn! It's nerve-wracking in the best-exciting kind of way. I love how the group slowly gets together and learns to trust each other again. I love how they joined team Alex one by one. Alex breakdown scene after Natalie died - It tore at my heart. I love Alex and Simon's friendship. Their bond is strong, maybe more than any other on the team. And when he... when he... was gone, Alex's reaction was so heartbreaking. "I prefer to spend the rest of my life in jail than to turn my back on a friend in need." - That kind of thing takes guts, Reina. It's something not even good people will be brave enough to do. Her belief and trust in Alex was exactly what I was looking for in the others (and though they did come around eventually, I still don't entirely forgive them). How is Quantico similar to how to get away with murder? The whole mystery of "what happened?" "who did it? ", switching from the past to present and leaving sinister hints we need to figure out as we go along. Also, they both revolve around a group of Young people who get into law to do good but instead find themselves in hellish troubles. But every show stands on its own, and I love watching both for different reasons. Plus, HTGAWM is so much darker. How is Quantico similar to The Blacklist? In season 3, Liz had to go on the run after being framed for something she did not commit, while her team (her friends) had to hunt her down. No one believed in her or trusted her, and the people responsible tried everything in their power to bury her. Which is basically what Alex went through throughout the season. If you enjoyed Quantico chances are you'll enjoy The Blacklist and HTGAWM too, and vise Versa. It's time for couples talk! In every show I watch, in every book I read, I have a tendency to ship. I just can't help myself. Quantico isn't an overly romantic show but there's romance there. That being said, I'm still not as invested in the couples as I would like to be. There are Ryan & Alex, which... I still don't know what to think of. Sorry, but I haven't fully forgiven Ryan for the whole "trying to bring Alex down" escapade. There are Shelby & Caleb, which are... I don't know. It seems they reconciled at the end but it's unsure whether they're back together. I didn't like Caleb in the beginning but I do like him now. He came a long way. It's Shelby I can't trust. That girl has a tendency of hating people for long periods of time. And then there are-were Reina & you-know-who. (sheesh, in my inability to say his name I turned him into Voldemort). Who do you ship, then? Or are you, like me, still unsure on the matter? "Alex, if you do anything stupid..."
"Let's save the world and you can lecture me later." I was so glad they gave us some happiness and lightness after S-Si (nope, can't say it). After everything they've been through, those few happy moments were long overdue. I just hope Alex won't be the main suspect again on the next season. It may be more exiting this way, but that girl has been accused and on the run twice in the span of one season - she deserves some time off from being the main suspect. I'm so-very looking forward to season 2. First FBI, now it's CIA. It seems like you're on to the next step, Alex. I wonder how it's going to be like. Will it have the same going back and forth between the past and the present? Will there be a CIA academy? We'd better have Alex's old team back (minus one *sob-sob*). "Revenge is the act of passion, vengeance is the act of justice." Great review, I loved hearing your thoughts on the show. I actually never finished the season, but I couldn't stop myself and read all the spoilers! I knew it, I guessed who it was. He was so suspicious, more than everyone else and I really didn't like him, so I'm glad it was him after all. Although I did suspect others at some points, as you said, the show makes you doubt everything and everyone. As for characters, I loved Alex, Shelby and the twins, they were all very interesting. Shelby was the one that later on changed and, as I quit watching, I don't know if she ever was the same. She seemed so harsh in the future timeline, it was sad, she was so sweet in the past. Thanks! I'm super-glad you liked it. Getting a comment about your post - best thing ever. Well, actually, reading is best thing ever but... you know what I mean. Really? you knew it was him? I really didn't. I mean, I never liked the guy but never really suspected him. Yeah... I really liked past Shelby too. It's future Shelby I had problems with.